Adventure camp at Bovay is one of the highlights of Pack 354's annual program. Year after year, memories are made here for first-time campers and seasoned scouts alike. Three square meals are included and served in the camp's air-conditioned dining hall. Pack 354's Outdoor Activities Chair will organize our group reservation. McNair Cub Scout Adventure Camp is a full program weekend camp for all family members at Bovay Scout Ranch. Tigers, Wolves, Bears, Webelos and their families will enjoy an exciting variety of activities at several program areas as well as food service in the camp’s air conditioned dining hall. A staff member in each area will provide program supplies and support the parents who will be invited to assist in leading the activities. Conducted at the McNair Cub Scout Adventure Camp at Bovay Scout Ranch, McNair Cub Scout Adventure Camps may include: seeking treasure in the lost mine, archeological quest at the dinosaur dig, high speed pedal feat at the BMX bike track, Robin Hood style adventure at the archery range, marksmanship at the BB gun range, action at the K.S. “Bud” Adams sports field, exploring our camp at the nature center, and splashing in the water at the David Weekley Family Water Park (weather permitting). Pack 354 will register as a group to keep all families together at one large campsite. All camp fees for scouts are covered in annual pack dues (additional family members can register at cost), but RSVPs are critical to ensure we provide accurate registration information. You MUST be registered and paid (for additional adults and accompanying siblings) at least 30 days in advance in order to be guaranteed attendance. Online payment accepted here. Camp includes three meals (lunch and dinner on Saturday and breakfast on Sunday with vegetarian and turkey patty options for those that don't eat meat), a special patch and all Scout program supplies. 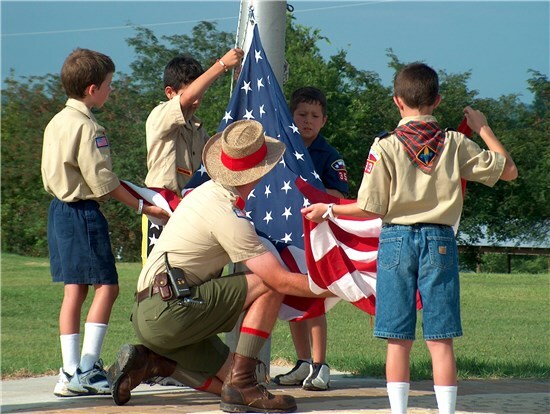 Children under five (i.e., siblings) may attend free of charge; however, please note that the program is designed for Scouts, and all attending Scouts must be members of the Boy Scouts of America. A camp store - Trader Vics - offers limited quantities of patches, snacks, beverages, and t-shirts for sale. RSVP to the Camp Chair to confirm your commitment to attend.